Today, was my last day as a full-time employee. It was sad to leave the great group of people I worked with but now such an exciting opportunity awaits. 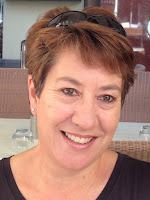 I have promised Colin (my husband) that I will have a week off with him before I set to work on my creative enterprises. 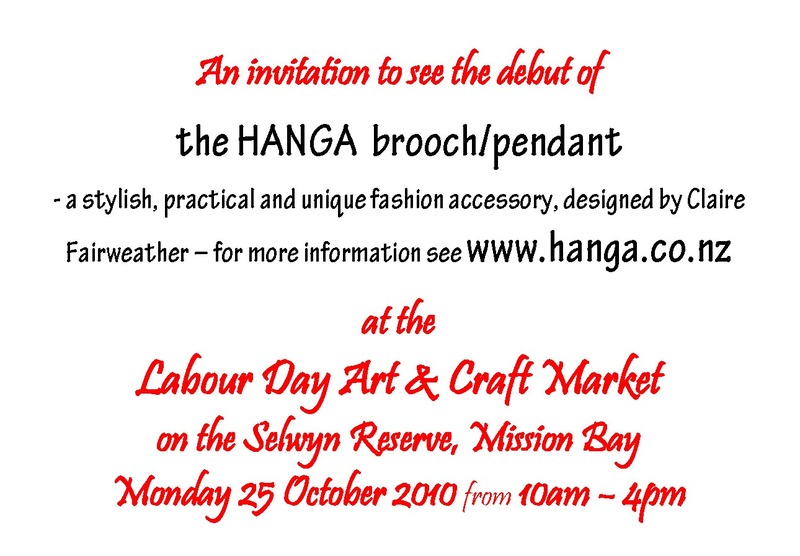 The debut of the HANGA brooch/pendant at Mission Bay, yesterday, was a very successful event. The weather was perfect for an outdoor event, attracting lots of people to visit and the whole place had a positive buzz. The only downside at the end of the day, was having the car towed home by the AA and wondering how much the repair bill would be - but at least it did not break down on the way! The HANGA display attracted alot of interest and, in addition to sales, some very positive and useful feedback was gained. A number of people commented on the excellent display I had constructed, showing how the HANGA could be worn, and several others said I should register the name/idea to stop anyone else copying it. 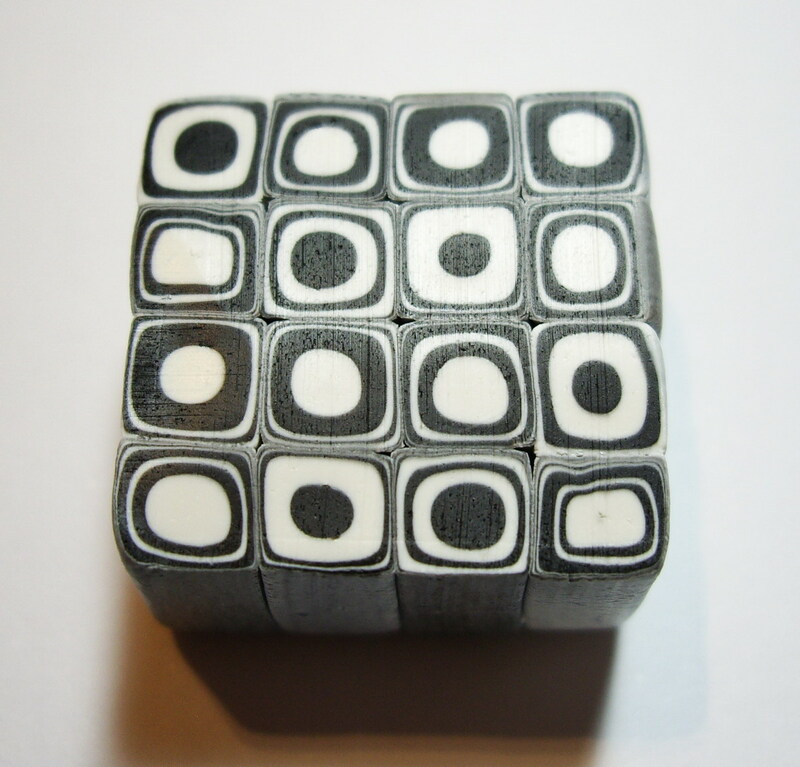 This is something that I had thought about previously and did quite a lot of research on. I had already completed an on-line application to register the name 'HANGA' as a Trade Mark but had not submitted it. For the last week or two I had been dithering as to whether or not I should but thought I would wait to see how the debut event went. On the strength of the interest and sales from yesterday's event, I have now submitted the application to the Intellectual Property Office of New Zealand (IPONZ), to register the name 'HANGA' as a Trade Mark. This is the display set-up I have made to go on the end of my table at tomorrows event. I have been working all weekend in preparation for the launch of the HANGA at the Mission Bay Art and Craft Market on Labour Day (Monday 25 October). 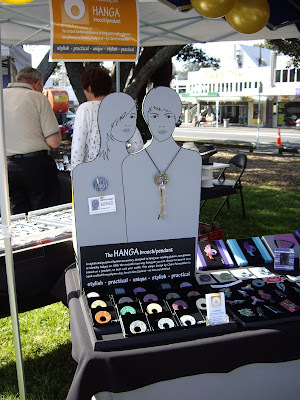 Not only have I been busy making the HANGAs, I have also been working on a new set up for their display. All is going well but I am very pushed for time to get everything finished as I would like. I can see that I will be working every night this week, after I get home my from my day job - still, I only have two more weeks in this job, once I have left I will have much more time available. 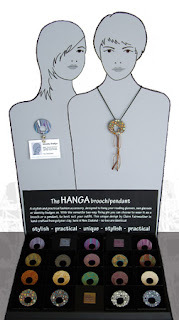 Be the first to see the HANGA brooch/pendant - a stylish and practical fashion accessory, designed to hang your reading glasses, sun glasses or identity badges on. 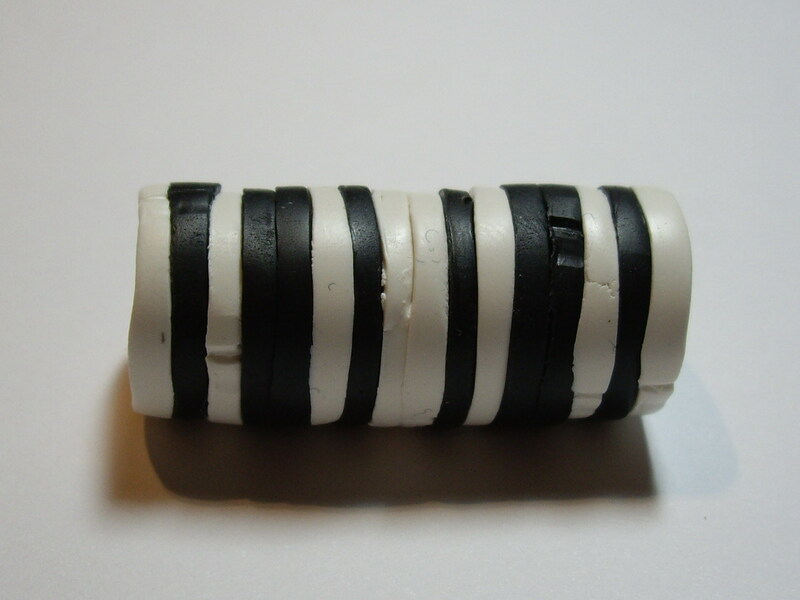 With the versatile two-way fixing pin you can chose to wear it as a brooch or a pendant, to best suit your outfit. 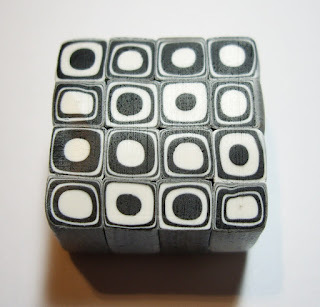 This unique design by Claire Fairweather is hand-crafted from polymer clay, here in New Zealand – no two are identical. 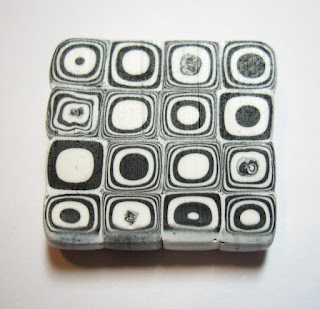 Claire has been designing contemporary art-brooches as a hobby, since settling in Auckland from the UK, in March 2009. The idea for the HANGA arose from talking to visitors at craft markets and her desire to make her art and craftwork functional. She says: “As a wearer of reading glasses myself, this is a useful and decorative accessory that I genuinely use, and with its multi-functions the HANGA makes a novel gift, when you are stuck for ideas for something to buy”. 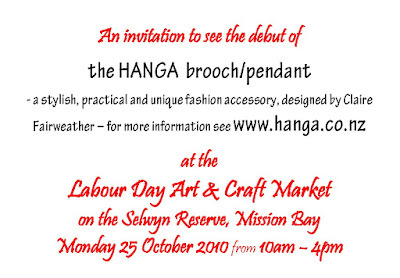 A limited number from the first HANGA collection will be making a debut at the Mission Bay Art and Craft Market on Labour Day, Monday 25 October from 10.00am – 4.00pm. You will find Claire’s stand on Row 1. Thereafter, she will be at Coatesville Market on the first Sunday of each month. Here are a couple of trial HANGAs, made just as brooches, as I am waiting for my 2 way brooch pin/bail findings to arrive. 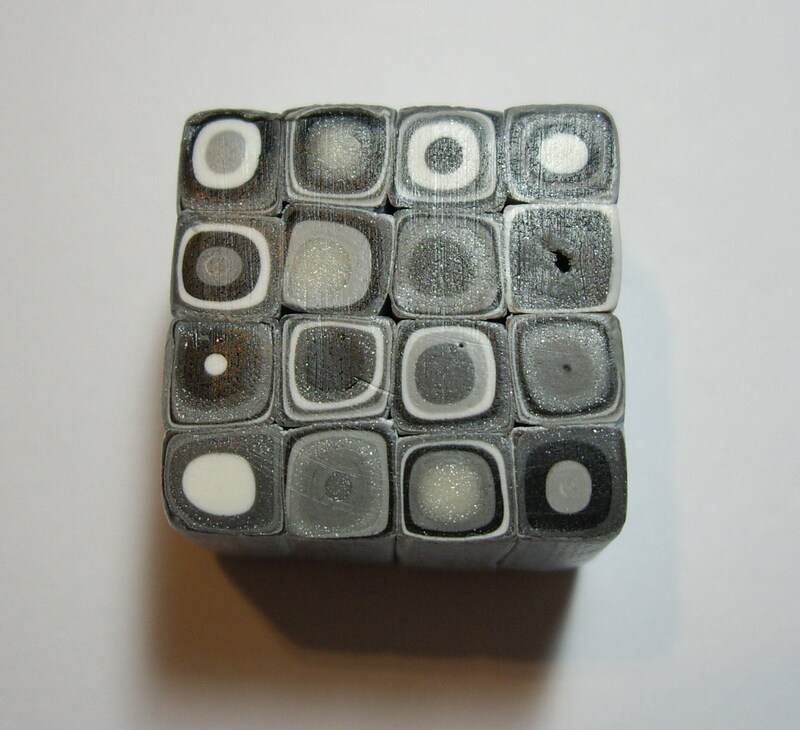 I am still working on perfecting the construction, particularly﻿ the way I finish the backs. 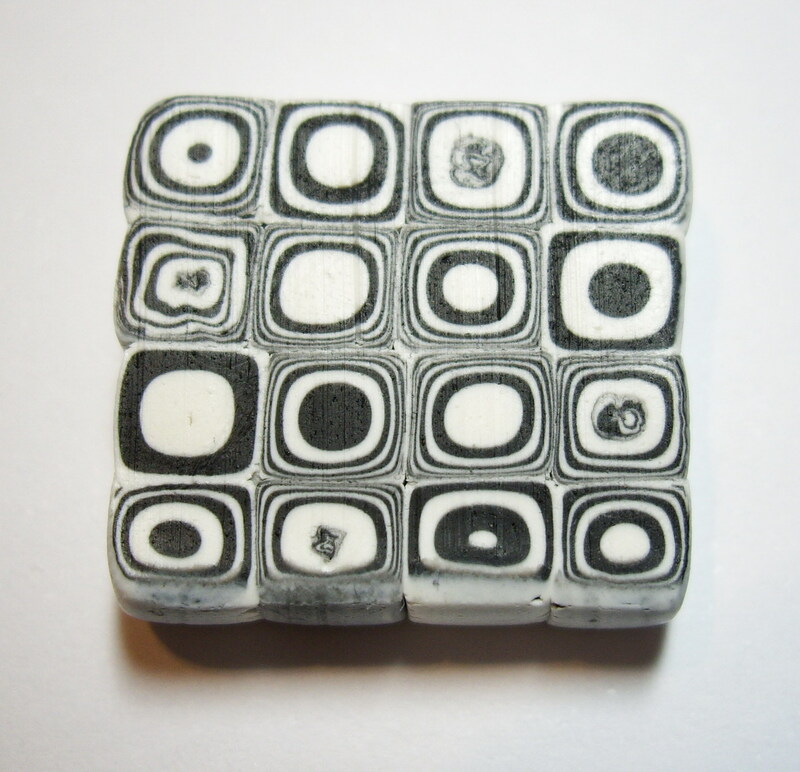 And another HANGA made from the black and white Klimt-style canes I made recently. In order to try and understand how to predict the outcome when creating Klimt-style canes, I have recently been making some with just black and white clay and some with black, white and grey/silver. 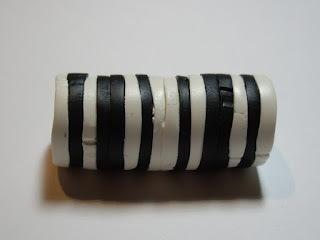 ﻿I have noticed that the first colour used when creating the log of different coloured discs, tends to predominate throughout the cane, so in future I will start with a light colour, as this last cane appears very grey. 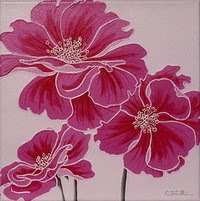 Today I have bought the domain name www.hanga.co.nz, so I can set up a seperate website for promoting the HANGA.